Christian Menn ranks among the most renowned structural engineers worldwide. He continues the tradition of Swiss excellence in the construction of bridges and has, both as designing engineer and as a teacher, been highly influential for decades. Many of his designs have become landmarks admired for their elegance and stringency. This new monograph documents Menn’s work, vision, thinking and philosophy. Around thirty of his designs, built and unrealized, are featured in large full color photographs, many of the newly taken for this book, and with rich technical detail and plans. Menn’s own texts show his passion as well as his immense experience in dealing with the particular circumstances and surrounding conditions of each project. Essays by fellow engineer David P. Billington, scholar Werner Oechslin, and writer and publicist Iso Camartin look at Menn’s oeuvre from different points of view. 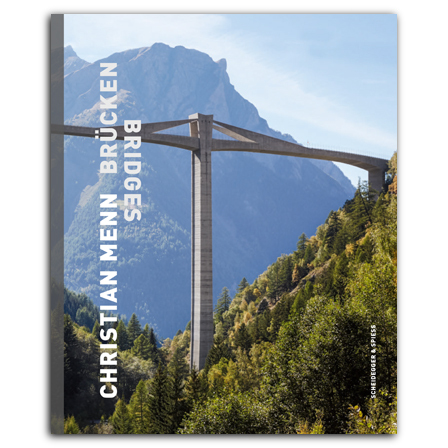 The book offers a rich insight into Menn’s lifelong examination of the fundamentals of his profession, and it is also a comprehensive reflection on the art of structural engineering. (1927–2018), graduated in engineering from ETH Zurich, where he also taught between 1971–92. In 1957 he established his own firm in Chur, Switzerland, working as designing and consulting enginner worldwide.